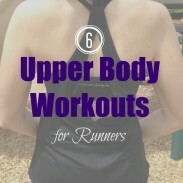 Time for another Monthly Workout Round-up for Runners! 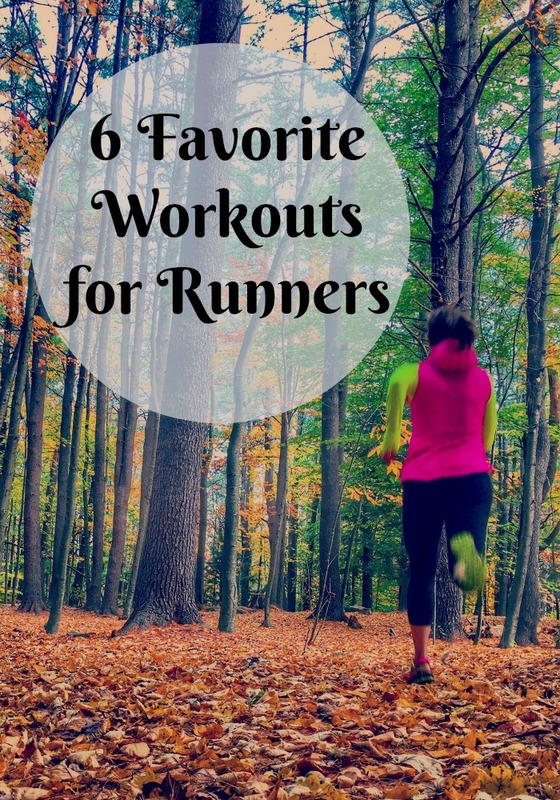 This month’s theme is possibly my favorite so far, as these 5 amazing women and I share our favorite workouts for runners. For the same reason I enjoy reading people’s training logs, I enjoy learning about people’s favorite workouts and giving them a try. Trying someone else’s favorite workout pushes you a bit outside of your comfort zone and adds variety to your own training. This past year has been sort of a breakthrough year of training and racing for me. I ran a big PR and broke 1:40 in the half marathon, I let go of my obsession with pace and learned to run by perceived effort, and I just completed a strong marathon training cycle. 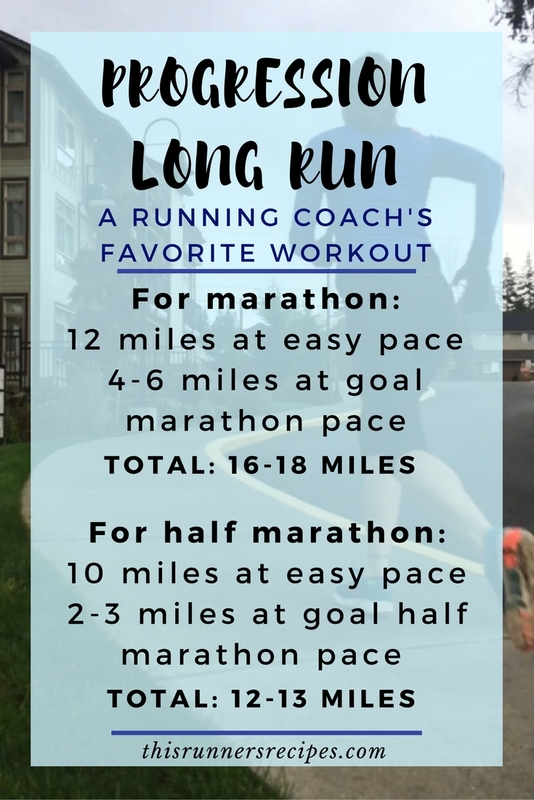 One of the workouts that transformed my running over the past year is the progression run, in all of its variations – which is why it’s my current favorite workout! I’ve included progression runs of all forms in my training. My body naturally prefers progression runs: start slow, ease into the run, and then push hard near the end. They’re versatile – you can use them in any distance run and progress to anywhere from marathon pace to 5K pace. They’re versatile – you can use them in any distance run and progress to anywhere from marathon pace to 5K pace – and dare I say, they’re fun. Progression runs teach your body what race pace feels like when you’re tired – which is very important for the half marathon and marathon. 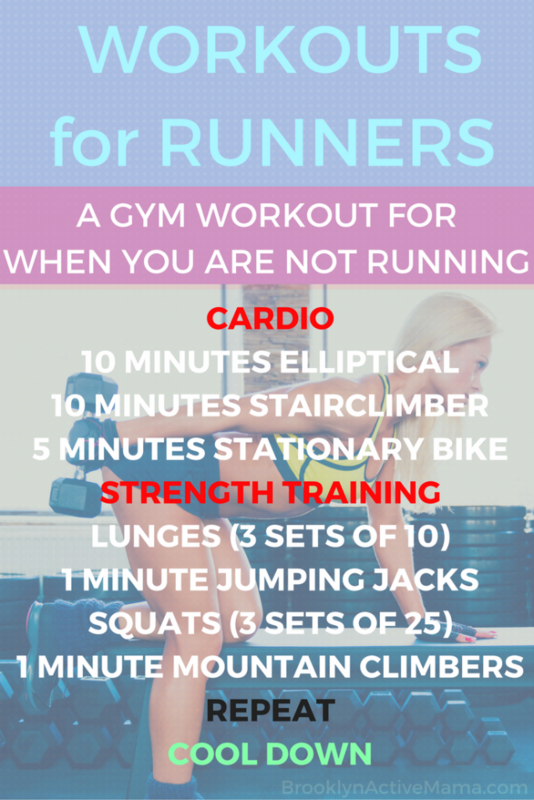 My favorite workout does exactly that: it teaches you to run harder when tired. The progression long run adds some variety to the basic long slow distance run without being utterly exhausting or risking burning you out before your race. Run 10 miles at your normal easy pace (45-90 seconds per mile slower than goal half marathon pace). For the last 2-3 miles, run at your goal half marathon. 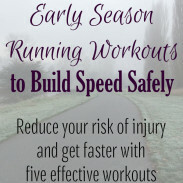 Run 12 miles at your normal easy pace (1-2 minutes slower than goal marathon pace). For the last 4-6 miles, run at your goal marathon pace. Cool down with a 5 minute walk and gentle stretching after each run. 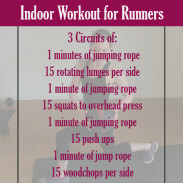 Be sure to try the other workouts! This year I tried to do more progression runs too. I’m a champion positive splitter (not something I should brag about!) so the progression runs really help to dial it for a race. 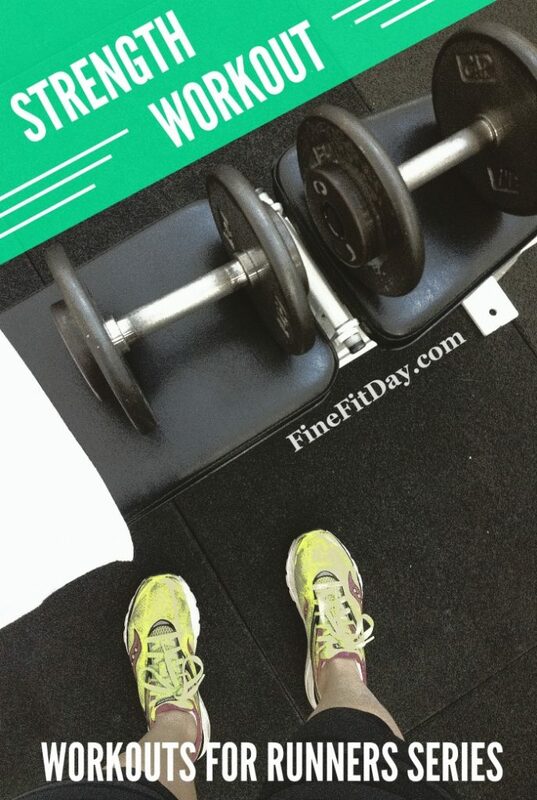 I love that you shared this as your favorite workout! Thank you! I really enjoyed this month’s theme! Progression runs really changed how I race – they’re so effective! 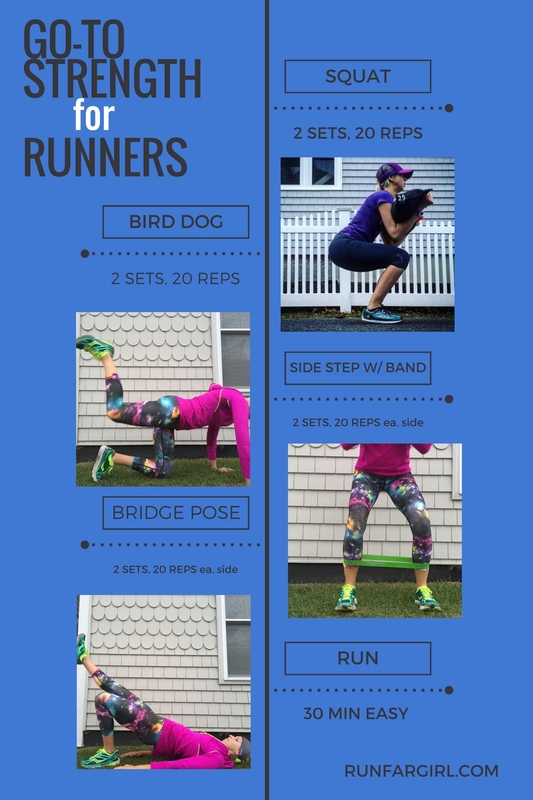 Another great collection of workouts! I also really like progression runs. Like you, I tend to run faster at the end of my runs. I think this morning Ill be doing an indoor workout like Pilates because it’s really foggy outside! Thank you! I hope you enjoyed your Pilates workout! Love all of these – obviously and I couldn’t agree more with your strategies for the marathon and half marathon. Speaking of – – GOOD LUCK this weekend!!!! Thank you so much, Allie!! I really appreciate the support! Lol mine aren’t either! They wouldn’t know the difference between 3K pace and a sprint even if I trained them. I’ve consciously tried to do progression runs while training for this half, even with my shorter runs. I finish up my runs on a straightaway–it’s a flat long, straight road and I can fly for about a mile. It’s been pretty effective. We’ll see how I do at this weekend’s half. I love progression runs for shorter runs as well! Good luck at your half marathon this weekend! I like those marathon progression runs, they are big confidence boosters. They are a huge confidence booster – knowing you can hit that pace on tired legs helps so much for the end of the race when things hurt! Thank you! I hope you enjoy it when you try it – let me know what you think! I needed to read this today. I haven’t done any sort of workout in a few weeks now (other than slow and easy running days). Now that Callum doesn’t nap, I can’t do my tempo treadmill runs during the day! I can’t do hard and fast runs in the morning. It’s just not going to happen. Slow and easy running certainly can have its benefits, but I definitely think you would like a workout like this! You can still start slow and easy for most of the run. I like to do progression runs for weekday runs as well where I do most of the run easy and just the last 10-20 minutes fast. I need to try all of these! 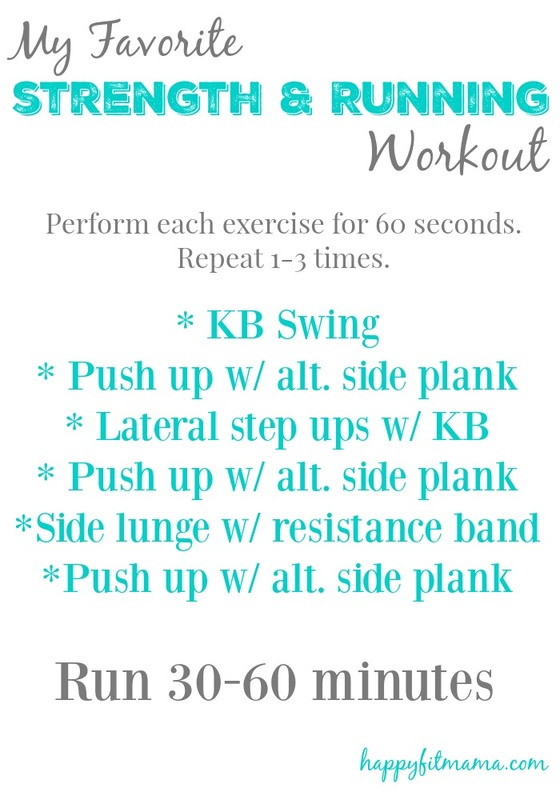 Me too – I want to do all of the other workouts, they all look so great! I really love progression runs. Even on my easy days, I try to start out on the easy side and finish a little faster, but still in the easy range. Granted, every run is sort of hard when coming back from an injury. I feel like progression runs have helped me a lot in shorter distances because I don’t start as fast and then crash like I used to! I think that’s the best part of progression runs – they teach you how to race well! I hope you are healing up well from your injury! Progression runs are my fave, too. I love track days but there’s something so fantastic about pushing hard at the end of a run instead of a standard cool-down. I like progression runs too, especially on the treadmill it seems!